We've been working on an advanced / pro color palette tool for quite some time and finally have it ready enough to share with you. We're still fine tuning and adding more updates... but we feel like this is the best color palette tool you'll find... if you don't think so, let us know what you'd like us to add or improve and we'll keep striving to give you the best experience anywhere. COPASO is an advanced color palette tool that helps you create the perfect color schemes and themes. With a scratch pad to save colors you're working with, a photo tool to extract colors and an advanced color picker and color theory wheel to give you tons of color inspiration. Using COPASO you can save your palettes to a private folder or download them to keep on your local computer. When you're ready, click publish and share your color palette with thousands of other color enthusiasts. If you're finding COPASO a bit too rich you're your color creating tastes, you can always use our basic color palette tool. With COPASO you can give each color a specific amount of space in your color palettes. This will help you show what colors you intend to be the base colors, secondary and accent colors. Click and drag the <|> icons above the color squares to change their widths. You can save a color you're working with by clicking and dragging it down to the scratch area. To set a main color above with one of the colors in your scratch, simply double-click the color in your scratch. The new advanced color picker in COPASO allows for even more precise color selection. You have hue, saturation and brightness sliders as well as input areas for Hex, RGB, HSV and CMYK color values. Also built into the advanced color picker are gradient step filters that will allow you to see any color with steps towards white or with steps towards black. To work with any of the colors in this filter, simply click and drag the filter color strip to the right of the color wheel onto your scratch area. Below the picker is our color wheel and color formula filters. By selecting one of the formula filters (Blend, Complementary, Triadic Tetradic or Split Complementary) the color wheel will allow you to spin the selected color around by clicking anywhere on the wheel. Once you've found some great colors in the preview bar on the right, all you need to do is drag the bar to your scratch area to begin using those colors. Double-clicking any of the color squares in the preview bar will update the main color picker to that color and give you a new perspective on your selected color filters. As mentioned above, we're very proud of COPASO and hope you'll find it very useful for all your professional and hobby color projects. COPASO couldn't have been built without the expert programming of Chris Williams and the design work of Stephen Hallgren. Last but not least the hundreds of thousands of COLOURlovers who have helped us build and grow our color community and who've provided us with great advice, suggestions and inspiration over the years. When it comes to Pantone + COLOURlovers, you could say we both love color... but I think of them more as the parents from the 50s who live long happy lives together but sleep in separate beds... as we might be more of the free-lovin hippies of the 60s... not that there is anything wrong with that. All kidding aside Pantone does a pretty crazy job of allowing people to translate colors across industries. If you want the yellow of your website, to match the yellow of your car's paint to the yellow of your favorite yellow speedos... they've created color software and specifications to make sure you always get the perfect hue. 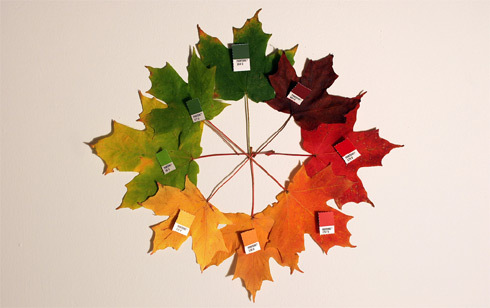 Thanks to Tina at SwissMiss I found a wonderful photo of leaves matches to their pantone colors and sought out to find more photos of people comparing colors in their real lives to their pantone cousins. Chris Glass is a creative guy who takes lots of fun photos... one I particularly love is one he took back in Oct. that showcases the range of colors a single tree can produce as the seasons change. "I’m obsessing over all the maples that are turning slowly this season–their tops red, fading to green. So much that I felt compelled to collect samples from a single tree." Linked from Chris' page was a Pantone Matching Photoset with lots of fun office color finds. v3 launched with a major new section... Patterns. We knew that you loved finding great colors and arranging them in color palettes... so we guessed that you might want something to do with those palettes (Seeing as you've already created more than 3,400 different patterns in 2 days, I think we guessed right). We launched with just a couple dozen patterns to color but hope to add hundreds more over time. Create a Pattern or Browse the Patterns that have already been added. Desktop Wallpaper, Website Background, Virb Profile, Myspace Layout, Etc... All of our patterns can be freely downloaded or used, but a link back to COLOURlovers is always greatly appreciated and please no commercial use or selling of our patterns. Not sure if how you want to use the pattern is commercial? Let us know how you want to use it. If you are the creator of a seamless pattern, Let us know and we'll happily add it to the site. The patterns need to be able to tile, be 5 colors or less with no gradients and preferably in .svg format. Tell us how you want to be credited and we'll add your link. Parrotfish are probably the most colorful living things on the planet. Not only are there 90 some species of them, male and female parrotfish sport different colors and have the ability to change their coloration and patterns repeatedly throughout their lives. Females tend to feature browns, greens, silvers, and grays, while males have more vibrant colors such as pink, aqua, orange, yellow, red, and electric blue. However, in the Mediterranean, the coloration is reversed, with females sporting vivid hues and males drab ones. Bizarre Fact: Some male parrot fish maintain harems of females. If the male dies, one of the females will change gender and color and become the dominant male. Parrotfish are mostly tropical fish that live in all the world’s oceans. The parrotfish family contains ten genera and about 90 species. They get their name from their powerful cutting-edged beaks they use to scrape from the surface of coral, algae, polyps, and other small plant and animal life upon which they feed. Parrotfish sleep in pajamas. Every night they secrete mucous from an organ on their head that wraps around their bodies, making them harder for nocturnal predators to find. Parrotfish meat isn't consumed much in the US, but is considered a delicacy in many other parts of the world. In Polynesia, it was even once considered a dish only fit for the king. Parrotfish can range in size from 1 to 4 feet (30 to 120 centimeters) in length and have a lifespan of up around 7 years. To learn more about the role of parrotfish in coral reef ecosystems, see the BBC News Report - Parrotfish to Aid Reef Repair. to emphasize that we have had little time to test the new site and trouble shoot any little hiccups... But, we're throwing a party and we couldn't do it without tons of new color love. We'll do a proper post in the next couple days to explain and better showcase all the new things that have been added, but until then you'll have to be a curious lover and go exploring. Version 3.0, aka Version Weee.0 is all about evolving the fun, creative and inspiring color community experience. Will be seeing some minor updates to the entire site, continuing our efforts to create an easy and enjoyable user experience. We'll be adding a new powerful tool that we've been developing for several months that will make you pro and amateur color lovers alike, very happy... and it can even run on your desktop! We'll also be evolving the love of color in a totally new direction for us. We know you love colors... and arranging them into 5 color palettes... now we're going to give you something creative and fun to do with those palettes. The world will see the new version of the site go online December 8th, and if you're in the Pacific Northwest, we'd love to have you join us at Rake Art Gallery for a party and interactive night of color love celebrating the new version and the amazing year of growth we've seen. This year our northern neighbors, Imagekind will be generously sponsoring the printing of all our color strips, palettes... and.... Well, you'll just have to be there to see what else they'll be creating for us. The event will go from 7:00pm to 10:00pm so join us before dinner, after dinner or enjoy our tasty beverages and snacks and join us for a lite dinner. 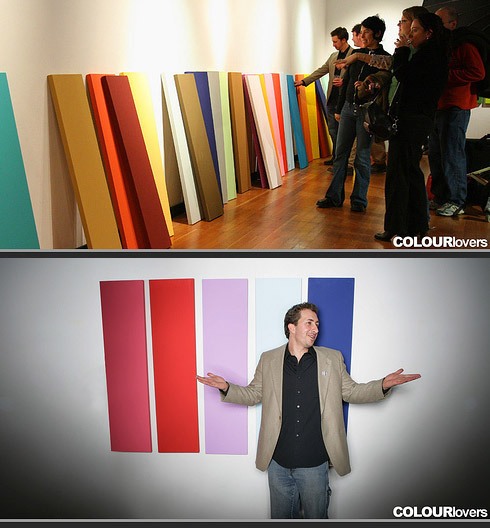 We'll have even more color choices this year for you to create your real life color palettes with, several computers to check out the new site on... and a Chinese auction for our full sized canvas art with proceeds benefiting HODR.org, a volunteer staffed disaster relief non-profit. We'll be adding more details as we get closer to the date, so stay tuned. Imagekind.com is one of the fastest growing online art sites. Their goal is to develop a fresh new online art experience that allows both consumers and professional artists a new outlet for sharing, creating and buying actual wall art from digital files. Our friends over at Coudal Partners pointed us to a Live Layer Tennis match in progress... This one is not only colorful and fun.. the creative forces are battling with flash. All matches take place on Fridays, live at 2pm Chicago time or GMT-6, Pop over and take a peek. Welcome to Layer Tennis’ first foray into the fourth dimension. Considering the constraints of most modern browsers, we had to skip the third dimension (depth), so the fourth will have to do. Time has always been an essential element of the game, the competitors (and commentators) face a cruel 15-minute deadline, and — hear me when I say — those seconds tick away much faster at LT HQ than they do in your office, as you kill the waning hours of your work week. This week, however, temporal space will actually tear through our 900x280-pixel battlefield, as renowned illustrators Trevor Van Meter and James Hutchinson face off in Adobe Flash. I pity their poor souls; if designing/illustrating/typesetting a volley isn't enough to do in a quarter-hour, they must find time to animate the volley as well. While this added challenge is likely to simplify the actual graphic content of the match (fine by me, I'm a bit of a minimalist), we're likely to see some great storytelling, as both competitors excel in that area, and each has an arsenal of ready-made characters that would make old Walt D. blush. (As I write this, I'm getting word that James, at least, is creating a new set of characters just for the match). Thanksgiving is celebrated in November in the U.S. and in October in Canada. Thanksgiving was celebrated in the U.S. on the last Thursday in November until in 1929 with urging from the National Retail Dry Goods Association, President Franklin Roosevelt extended the Christmas shopping season by one week and moved Thanksgiving to the fourth Thursday of November. Here are some fun facts about the holiday and some color inspiration to help get you in the turkeyloving mood. The modern day holiday is celebrated as an occasion to give thanks for the things we have and the people we share life with. Well, Thanksgiving at the COLOURlovers house was a little smaller last year and I want to take this moment to say that I am thankful to all 38,000 of you who have become members of our growing community. Have a wonderfully color loving holiday. Scholastic has some great information about the History of the Thanksgiving Feast and how the history has evolved since the 1621 feast the Pilgrims shared with the Wampanoag to celebrate the colony's first successful harvest. The black-feathered (and thin) Wild Turkeys are not same as the white-feathered (very overweight) ones that we serve at Thanksgiving and other holidays. 45 million Turkeys are eaten each Thanksgiving. A 15lb. Turkey consists of 70% white meat and 30% dark meat. The Colors in Your Dreams: What Do They Mean? Are you on that deserted highway, being chased down by Sasquatch who is driving an orange VW bug again? Dream interpretation / analysis is what people use to help them figure out the meanings of their dreams. It is an old art, going back to the ancient societies of Egypt and Greece, where divine messages were thought to reach you through your dreams. Only people with special powers were able to decipher the hidden wisdom of these messages... Now days anybody can do it... but it doesn't hurt to think you have special powers. In more recent years the study of our dreams was taken up by major Psychologists like Sigmund Freud and Carl Jung. These two men had differing views and exactly what the symbols in our dreams meant, but both considered there to be great meaning to be extracted from this area of our subconscious mind. First we'll look at the meaning of colors in your dreams and then provide you with some basic dream symbolisms to help you unlock just what your subconscious is trying to tell you about the orange bug owning Sasquatch who keeps visiting you. The below color associations in dream interpretation should be thought of as loose guides. First, think about what personal color associations you might have... ie, Blue can generally symbolizes truth and wisdom... but if your high school football team wore blue jerseys and the varsity jocks stuffed you in a locker every morning... you might have a different personal reaction to the color blue. Red can symbolize passion, courage, or your emotional relationships... but it can also be the color of danger. You will need to think about what your personal associations are with red and look at the context of the rest of your dream to find out if you're seeing love or danger. Often they go hand in hand. Orange symbolizes sociability and friendliness. This color could be showing you new interests or things that are warm and friedly towards you... or maybe your thoughtfulness towards a particular interest. Yellow Topaz is also the accepted anniversary gemstone for the 4th, 19th or 23rd year of marriage. Historically the stone was believed to be a source of strength and healing. In the Middle Ages topaz was through to cure both mental and physical ailments... and back further in Roman and Greek times it was thought to increase strength, improve eyesight and even make the wearer invisible. Topaz is found in a variety of colors including: brown, red, orange, pink, sherry, yellow as well as colorless and is most often located in Brazil, Sri Lanka, Russia, Australia, Africa, Mexico and Pakistan.